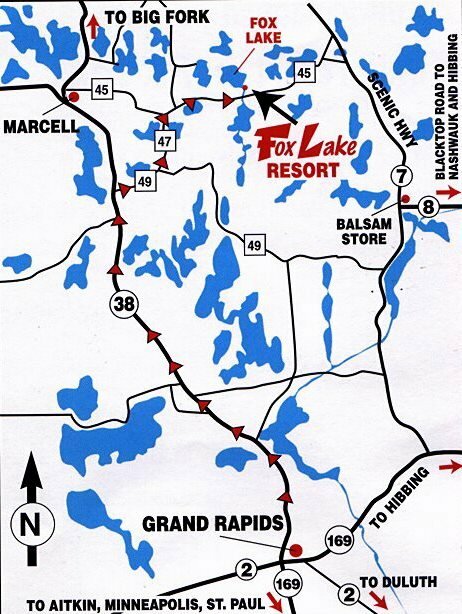 Get in touch with Fox Lake Resort and plan your next Minnesota Family Vacation! Our resort is easy to find, it is approximately 34 miles north of Grand Rapids, Minnesota. If you choose, use the mapping link below to map your route from your home to our driveway. Or, use the map to the right -- click here for an enlarged version for printing. Click here to create driving directions from your home directly to our driveway. For more information, please call or email us via the form below. The drive to Fox Lake Resort is scenic and pleasant. Enjoy! Click on the map below for an enlarged version to print.